This edited article about birds first appeared in Look and Learn issue number 548 published on 15 July 1972. A beam of light filters through the trees of a forest glade and lights up the magnificent colours of the jay as it flashes past in its flickering, faltering flight. Only rarely does anyone see this wonderful masterpiece of colour with its hues of cinnamon, vivid patches of blue, and stripes of black and white, because the jay is such a shrewd and cunning bird that it is more often heard than it is seen. Its harsh screech echoes through the woods all over Great Britain except in the breeding season when it is almost completely silent. It is in spring that the true character of this elusive creature is revealed. As a plunderer of other birds’ nests, it has made many enemies. It will perch on a branch of a tree and look round for an occupied nest to raid. Instead of swooping down instantly and driving out the parent bird from its nest, it will remain on its perch and wait patiently for the parent bird to leave its nest of its own accord. 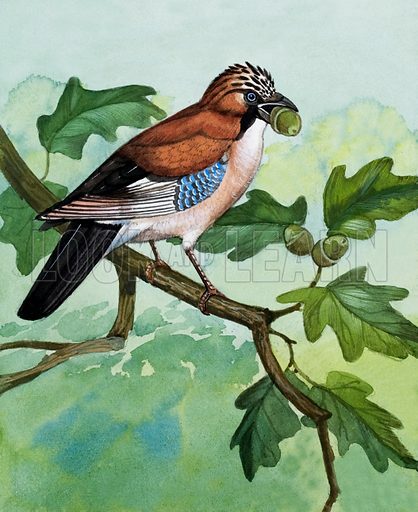 Then the jaunty jay sneaks down slyly and steals an egg or a young chick and flies off before the parent bird returns. Even if the owner of the nest is six times smaller than itself, the jay will always avoid a confrontation with it. This lively, colourful bird has an insatiable curiosity and although it is a priceless ally against slugs and harmful insects, it is remorselessly persecuted by gamekeepers because of its fondness for pheasant eggs. Gardeners have often waged war on it too, because of its irritating habit of visiting vegetable plots in the early hours of the morning to strip the pods from a whole row of peas!